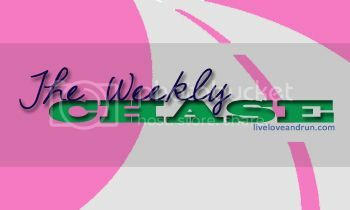 If you haven't heard about the Weekly Chase that our friend over at Live, Love, Run does each week- you should really go over and read about it. Even if you don't blog, it is an awesome way to keep weekly goals and try and reach them! If you want to know more about the Weekly Chase go HERE. In last weeks Weekly Chase, we gave ourselves lots of goals. We want to share with you how we did last week before we share the goals for this week. 1. Get my boy's bedtime routine started by 830pm each night so I have more time with my husband in the evenings. --I have done really, really well with this. Other than the nights that we have been with friends... It has been going great. AND he has been napping better at night! Go Little Man! 3. Mileage Goal of 21 miles; keeping it the same since I did not hit it this week.--I did! Although only 18 of those miles were running.. but I worked hard EVERY day this week. I did something. I am super proud of me! 4. To Run 3 early mornings this week! --Yea, didn't happen, sadly. SIDENOTE: I don't have a lot of goals for the next couple of weeks because my job will be in high demand with the school year upon us. So really my goals are focussed on being successful even through my crazy work schedule. 1. Run 20 miles this week --Didn't make it, but that is okay, I am very proud of my active week in the midst of such a busy week at work. I ran a total of 13 miles, and one of those was 7 miles at once, so I still got in a long run. 2. Keep my house moderately clean since I will be working late throughout the week--I feel like I succeeded at this! 3. Do 3 workouts throughout the week besides just running--I did this and loved every bit of it! I did an arm weight workout, I did a yoga class (which I LOVE<3), I did a Zumba class for the first time, which is awesome!, and I played sand volleyball twice! It was a great week and my workouts were not totally consumed with running! 4. Eat healthy despite the fact that every meal will be provided for me in Fast Food form (This is part of my next 2 weeks at work, I work at a university and we are getting ready for New Student Orientation, so as we work the school buys us food...it is usually very hard to not just eat whatever...my office is full of yummy snacks too!) --Some days were good with this, but some were not! 1. Work out all 5 days this week, totaling at least 22 RUNNING miles! 2. Start going through our stuff and posting things on Craigslist! 3. Call around and get rates for apartments, storage, etc. 4. Complete the Virtual Scavenger Hunt! SIDENOTE: I'm not trying to slack on goals, I'm just not wanting to set myself up for failure when I will literally be working from 7-8am to about midnight almost every night this week. We are so thankful for all of you that read us. We enjoy taking our time to share such awesome things with you and appreciate those that take the time to read us and to follow us on Facebook!! Thank you SO much!! Older PostSPIBelt Winner AND Another Giveaway!